A Brazilian woman and her three-year-old daughter have taken refuge in their country's embassy in Oslo after Norway's child welfare authority attempted to forcibly take the child into care. Vitoria Alves Jesumary, 37, and her daughter Sofia fled to the embassy last Thursday, and are refusing to leave until Norway's government gives assurances that they can both travel freely back to Brazil. "Put simply, it's an abuse of authority," Ana Lucia Lima, a friend of Jesumary's and a pastor at a pentecostal church in Oslo, told The Local. "They say she's not eating like it's normal to do here in Norway and that she's developing a dominating character among her friends. They say this is because she's not getting good parenting." "She's being taken good care of by the mother: She's not being hit, she's not being abused, she's getting her food." Lima likened the case to the Norwegian child welfare authority's controversial decision to take two Indian children into care in 2011, a decision the children's parents claimed was taken because they fed them by hand and slept together with them in the same bed, both entirely normal in India. The authorities released the two children a year later to be cared by the couple's uncle in India. The Brazilian embassy is giving Jesumary its full support, and Lima intends to lead the Brazilian community on a march to the Norwegian parliament on Saturday in protest at the decision. 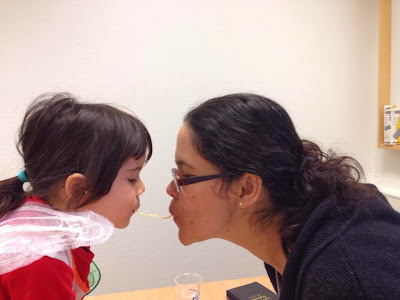 Jesumary, who speaks neither Norwegian nor English, recently divorced from the girl's father, a Norwegian of Chilean descent, and fought a court battle for custody over the child, which ended up involving the child welfare authority. The father told state broadcaster NRK that he also now wanted the mother and daughter to return to Brazil. Francisco Chagas Catunda Resende at the Brazilian embassy told the broadcaster that although Brazil respected Norway's laws and institutions, embassy staff believed that it was "in the best interests of the child that the two be allowed to travel home". “We’re trying to resolve this case diplomatically with Norwegian authorities,” he said. “It is a very uncomfortable situation for the embassy." Below is another photo of Vitoria Alves Jesumary and her daughter.